A century ago, the harvesting of live greens for Christmas was a lucrative business and one which brought numerous outside entrepreneurs to Lakeville in search of evergreens, holly and laurel. Greens were taken from the woods of Lakeville in large quantities, frequently by the wagon load, and brought to Boston where they were processed for sale. The automobile increased access to rural Lakeville and Middleborough so much so that ultimately greens were removed in such quantities as to raise concerns about over-stripping the woods, as well as the taking of greens from private property, the latter issue prompting the attention of local police by 1930. The annual search for Christmas greens in Lakeville and surrounding communities continued throughout the first decades of the twentieth century and appears to have contributed to the decline of a number of species locally, most notably American holly (Ilex opaca) which was formerly abundant in local woods. In 1929, the scarcity of holly inlocal woods was lamented and attributed at the time to a "severe and protracted drought" in the summer and fall of that year. What holly could be found was quickly taken by gatherers of Christmas green, irreparably damaging trees and furthering the ecological decline of the plant locally. There have been several complaints received by the police from land owners in various parts of the town that their woods are being entered and stripped of holly and other evergreens without authority and in some cases holly trees have been stripped to such an extent that they will die. One man reports that automobiles have come to his place Sundays and leave full of small spruce or pine branches while others come and get small cedar trees. Arthur Winslow and Edwin C. Bennett of Marion road are among those who have reported to the police. Chief Sisson is checking up on this trespassing and prosecutions are likely to follow. Middleboro Gazette editor and owner Lorenzo Wood commented upon the situation in late December. Clearly unapproving of the unauthorized removal, Wood was at a loss to provide a solution, as the geographic expanse of Middleborough (as well as Lakeville) did not easily lend themselves to prevantative patrols by local law enforcement. From the number of complaints received by the police this holiday season of the reckless slashing and taking away of Christmas greens from the woods in this section without permission from the owners makes one wonder what kind of complex these people are laboring under and where the principles of the rights of others comes into the picture. 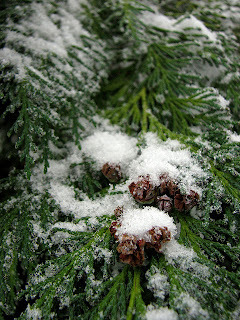 Holly trees, which in a great way are becoming extinct in many localities, have been hacked and stripped of their branches leaving them to die, trailing evergreens have been pulled up by the yards and small cedar and hemlock trees have been carted away by the hundreds, all without the slightest regard to the owners of the land or tees thereon. In some of these instances, the trespassers have probably cut a tree for their own use, but in most cases it has been a commercial proposition and the trees no doubt have found their way into the markets of the nearby cities. One of the rankest cases of this utter disregard for others' property came to the attention of the police this week when a local farmer complained that a fine blue ornamental spruce of nine years growth which stood near the roadside had been cut down and taken away. Last summer the owner refused $25 for this fine tree and now probably with a few days use as a holiday ornament it is of no use to anybody, and to think that a tree that would serve the purpose just as well could be bought from regular Christmas tree dealers for 50 cents. It all fits into the jig-saw puzzle of conditions of today when apparently there is disregard for law on all sides. In the case of these tree thefts, what can be done about it? Nothing much except when one happens to catch the intruder and hail him into court. To watch for these depredations would take a police force as large as a regiment. Middleboro Gazette, “Lakeville”, December 18, 1908, page 2; “Middleboro”, December 27, 1912, page 5; "Woods Stripped of Evergreens", December 12, 1930, page 2; "The Spectator", December 26, 1930, p. 1.